This Page contains all post related to my CCNP ROUTE study. So Last time I mentioned you can generate traffice between two routers using TCP small Servers. This does work fine but there are some limitations, it can’t genetrate large amounts of traffic, it puts a high load on the CPU and it does not tell you much once it has completed. A second method I came across is “TTCP” (Test TCP) which is avalible on many of the more recent IOS versions (11.2 upwards). This method not only gives you more control over the data that is sent, but also will provided you with infomation on how the trasfer of data went once it is complete. TTCP is also avalible for Windows and Linux/Unix, which means you can test between various end stations on the network. It is all very simple to set up, simply at the “>” or “#” prompt type “TTCP”, and then follow the prompts. You will need to set up one router as the sender first, and then the second as the reciver. You can leave all the settings as default (you may want to reduce the “nbuf” setting as the default of 2048 can take some time to complete, espicaly on a slow link). Once complete you will get an out put of time taken and bandwith achived among other stats. Again this is a very simple tool to give you a indication as to the state of a link, you can find more details in the below link to the CISCO site. nothing fancy just enabling the small TCP servers (#service tcp-small-servers), but a nice simple way to push some data across a link between two routers. The article also mentions some other methods so will be looking in to them as well. 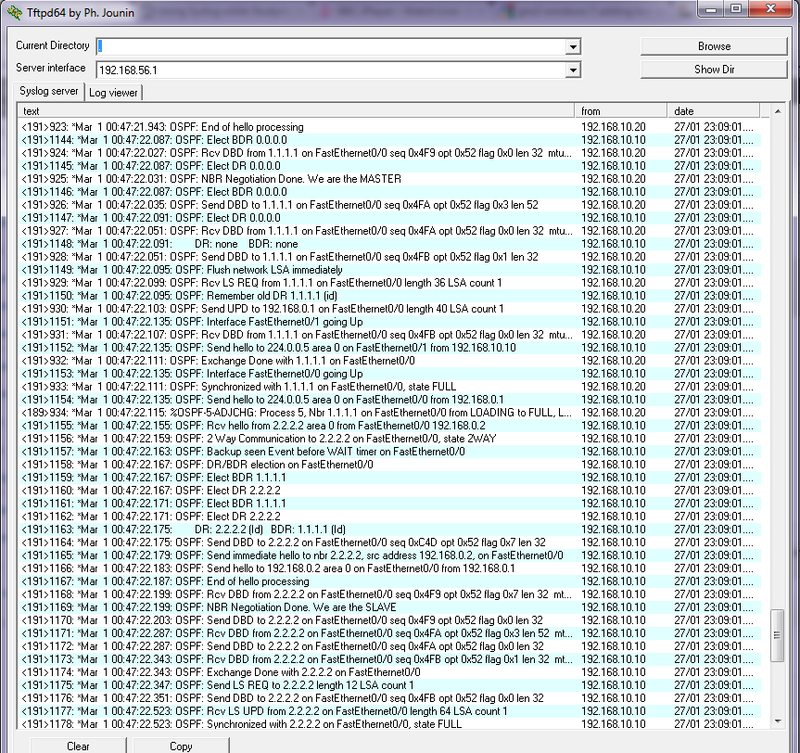 SecureCRT sending commands to multiple sessions. I came across this in secureCRT and thought I would share it. When labing things up (and indeed on real networks), there are times when you need to send the same command to multiple devices. you can of course copy and paste between the sessions but what about if you want to past the exact same block of configuration to 20 devices, or just want to do something simple like save the running configuration on your devices in you lab before you close down? Well SecureCRT has a nice little feature to do this, so before enabled secure CRT looks much like below, as you can see I have several tabs open. However by going in to the view menu up the top there is a option to enable the “chat window”, this will bring up an extra panel at the bottom of the screen. Then by right clicking in this new panel you can enable the “send chat to all tabs” option as shown below. Now any command typed in the chat window will be sent to all devices. Commands typed in the main terminal are still only sent to a single device. The more I use CRT the more I like it, written quite a few scripts for it now, if you know any VB script or Java you can pretty much do what ever you like as SecureCRT has a nice simple API in to it. I am finally moving house this week, so after that should have more time to post on here, and will take some of the script I have and tidy them up and post them for people. So having now completed both foundation and cert guides here are my views. First the two have very different goals that they are trying to teach, and approach things in the same way as you would likely see in the Real world. In the real world generally Routing protocols stand apart, while you may run EIGRP and OSPF with in he same organisation, most people will keep them separate and they will only interact at the borders. And there are only 3/4 major routing protocals that you woudl expect to see. While there are others these are the common ones that most people will using there jobs. So the ROUTE exam deals with these along with redistributing the routes between them. And each is covered in some detail. On the other hand has many more topics, and in the case of switch’s many of these will be run on the same devices across the entire network, (eg. VLANS, Spanning Tree, ACL’s Switch Security) so the number of topics in the SWITCH exam is much higher. They are covered in less depth individual than the topics in ROUTE, however you are expected to understand how they all work together and how issues configuring one can cause issues in others. A partial list of topics covered in switch are. STP enhancements like BPDU guard and ULD detection. So the question of what one is hard and what one is easy will very much depend on the person taking them, and the current experience they have. Many people do seem to find the Routing exam nicer and I think this is because you can take each topic seperatly and concentrate with out worrying about the rest. While I enjoyed Switch as it was lots of bite size chunks to get stuck in to. People also ask what one to take first, honestly I don’t think knowing either one will help learning the other one, as long as you have a decent understanding of networks. Personal I would first go for the one you have most experience with, and get it under your belt first. The only one I would suggest leaving till last is the Trouble Shoot as this assumes you have knowlage of both Switch and Route. I have been getting back in to my studying a lot lately and one thing I have found is the need to use a lot of debug commands so I can watch what is happening during things like routing updates and neighbour formation. One thing I do find though is that I am forever having to turn debug on and off, forgetting to do one or the other, and when it is on it clutters up the screen a breaks up the config I am entering making it difficult to read back. Which got me thinking, I have used syslog servers a lot in the past, so why not send all the debugging out put to a syslog server and turn of logging to the console? This way I can have all the debugs in one place, and keep the console of the devices tidy so I can see what I am doing. Now if you are doing this through GNS3 you will need a cloud connection so your PC can talk to your GNS3 network. If you are not sure how to do this there are lots of videos and walk though on the net, however the one below is one of the best I have found, very clear and complete. How-To: Using the Cloud in GNS3 to Provide Internet Access from Matthew on Vimeo. 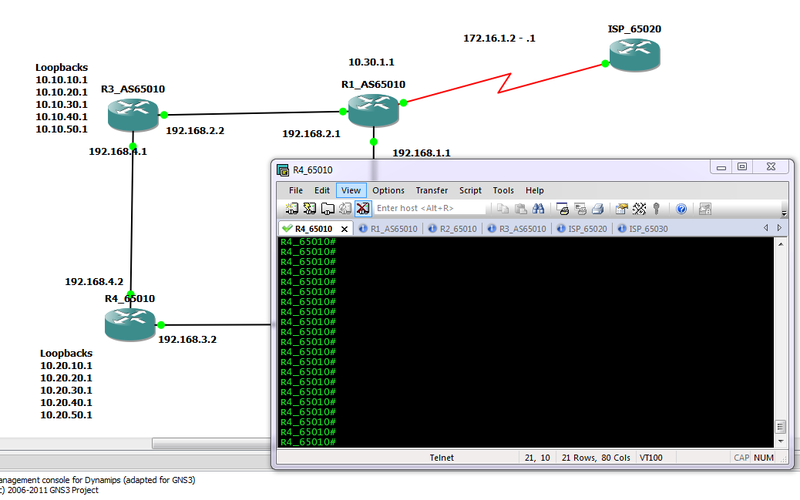 So once you have your cloud set up you then need to set up a simple GNS3 topology, Here I have set up 4 routers running OSPF connected through a switch as I am looking at the DR and BDR election process. then of course you will need a SFTP server, in windows there are two good free choises, for a realy simple server that can run with out install try, http://tftpd32.jounin.net/tftpd32.html simple but does all you need, just make sure you disable dhcp and other none necessaries services in the settings. For a more complete tool try http://kiwisyslog.com/, they have a free syslog server offering that allows filtering and more. In either case set it up and insure it is listing on the loopback interface, in the case of TFTP32d this is simple a case of choosing the interface from the drop down list. Finale we need to change the logging setting of R1 and R2 to direct debugging message to the syslog server and not to the console. Remember debug messages are level 7 so we need to set console logging to level 6 or lower and trap logging to level 7. the following code will do just this from global config mode. So now we can enable the debugging and reset the neighbour relation ships to see what it looks like. 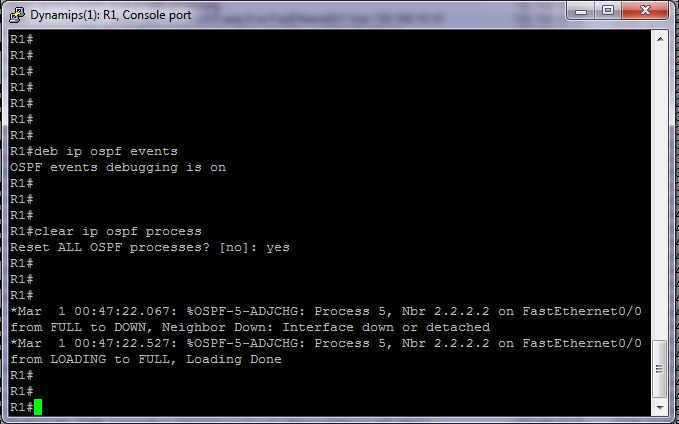 So not much there apart from we see the neighbours bounce as I clear the OSPF process. So how about on the syslog server?? So here are all our debug messages, for us to scroll through and review at our leisure, If you have something like Kiwicat syslog server you could filer them in to views, based on device that sent it, or text with in message, ect. You need to make sure of course that you either have the device connected directly to the syslog server network, or it has a route to get there. Directly connected is always best of course as you will insure that as long as that interface on the device is up you will catch all messages. On real hardware simply use a spare switch or create a separate VLAN and do exactly the same thing. I have found for large labs this works great, indeed for testing setups for clients its great as well. once you have insured the correct debugging is enabled you can walk though test scripts and plans, safe in the knowledge that you have a full detailed log of every thing that has happened. Simple to set up and hopefully some of you will find it useful. 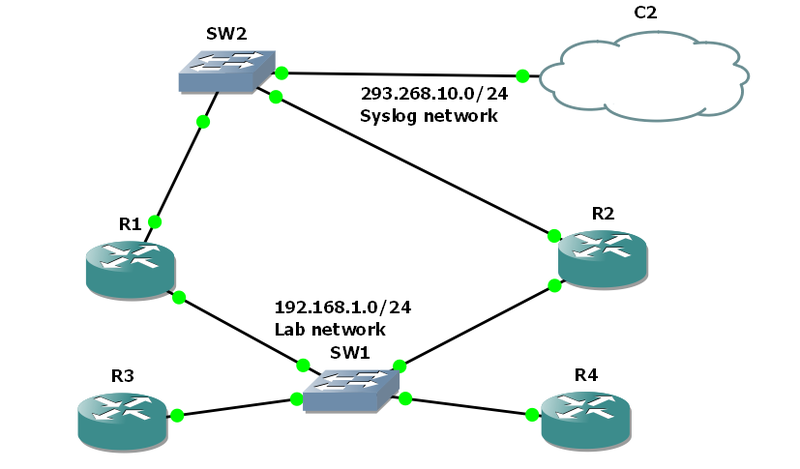 I decided that rather than just use other people labs I would come up with a few of my own, the following lab is very simple, requiring the enabling of EIGRP on two routers so they form a neighbour relation ship, and setting up which routes will be advertised. Followed by some simple summarization to reduce the size of the routing tables. To start with we have two routers connected via a point to point link on interface Fastethernet 0/0. Each also has 10 loop back interfaces configured with various /24 networks configured. The aim is simple, enable EIGRP with an AS number of 10, form a neighbour relationship between the two routers and update the routing tables so both routers can see / reach all configured networks. Ideal use as few network statements as possible, while remaining as specific as possible as to what networks get advertised. Autosmmorization should also be disabled. After completing this, a #show ip route, should display something like this. Now to reduce the size of the routing table we can manually summarise the routes. This is carried out under the interface that is sending out the update (in this case it will be fast ethernet 0/0 on each router). Again we want to be as specific as possible. The completed LAB uses multiply summarization statements , this increase the specificity of the summarization at the expense of adding an extra route in to the table. The routing table should now look something like. So the routes from Router 1 are now summarized in to 3 blocks. 172.16.0.0/21 which would include the first 8 networks, plus the 172.16.8.0 and 172.16.9.0 /24 which fall out side the summarization. Note also the routes to null that have been entered. When you set up a summarization, the router will automatically set up a route to null for that network. The reason for this is that you many not actually have routes to all the subnets for the network you have advertised as a summary. Imagen in the above case there was no loop back 5 and 6 on router 2, so no networks 172.16.28.0 and 172.16.29.0 /24. But the router is still advertising a summary address that includes them. When packet arrive at the router they are routed based on the most specific match. so a packet coming in with a destination address of 172.16.27.59 will match both the following routes. but because /24 is more specific than /21 the route to the loop back interface will be used. However if there is no more specific route, then the null route will be matched and the packets discarded. OK I said it was simple and it is. The topology files have both the starting position and my completed example. This is of course not the only solution. You can argue there are neater ways to do it, but I chose to use multiply statements to show how specific networks can be picked and what happens when summary address do not exactly match the networks that are configured. There will be one more EIGRP Lab coming up that will be more involved and included redistribution of static routes and manual formation on neighbours. This command is enabled by default on routers and disabled on layer 3 switches (some newer IOS do seem to have it enabled). 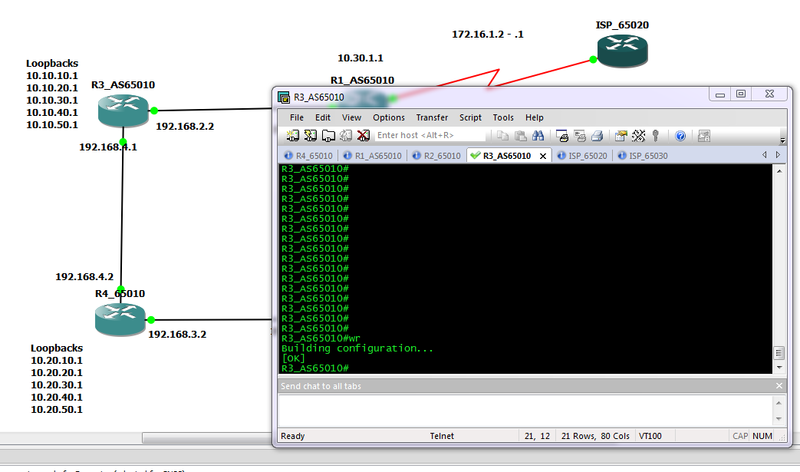 Running this command enables routing on the device, with out it no routing of any kind will be preformed by the switch. This sets the destination to pass all unknown traffic to, traffic that there is no specific entry in the routing table for. Enters into the eigrp configuration mode for the stated AS number, all routers running eigrp that are so share routing table/information, must be running the same AS number. If this is different then routers will not form neighbour relationships. By default this command is set to be enabled (although I believe in IOS version 15 is is now defaulted to “no auto-summery”). Having it enabled will cause EIGRP to automatically summarise all routes to their class full boundaries. Most people will want to diable this to give more control and manage summarization manually. This command has two separate effects. First it will enable the sending of routing update out of any interface that matches the address and wild card mask. Secondly it will advertise the networks that those interfaces have assigned to them. if for example you have the interface with the following ip address and subnet mask assigned. 192.168.5.254 255.255.255.0. and you add the eigrp network command. eigrp will send out updates on that interface, but these will included the advertised route 192.168.5.0 / 24, as this is the network subnet assigned to the interface. Image you run the last command (network x.x.x.x y.y.y.y) on the IP range for an interface that is connected to an end users network, with no other routers to form neighbours with? In this case you most likley do not want to send out routing updates but you still wish to advertise the network. In this case you can run the passive interface command to prevent multicast hello and update messages getting sent out. Now Imagen you have run the passive interface command, but you wish to still send and receive updates from and two specific routers out of that interface? Using the neighbour command allows you to do this. In fact setting a neighbour in this method effectively turns the interface in to a passive interface by changing the hello messages from using the multicast address, to using unicast addresses. If you have disabled auto-summary in the eigrp config mode, you may still want to do manual summarization. Configured under an interface, this command will summarize all routes that are advertised out that interface and that fall in to the summary network specified in to a single routing advertisment. Multiply summary address can be configured per interface, to cover multiply summary routes. This will display the current routing table that has been populated by all routing protocols running, plus static routes and connected networks, that is used by the router to make decisions on the actually forwarding of data packets. Show details of all networks that EIGRP has learnt about, details of how to reach them and what neighbours have advertised them. things like which one is the successor and feasible successors are shown here. This is a display of the topology table. Now this table is not complete, so look out for part 2 to this table for when we get on to redistribution and more complex EIGRP setups.